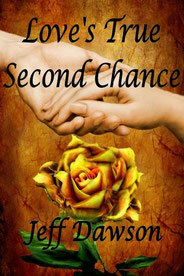 I was introduced to Jeff Dawson through a mutual Facebook group and discovered his book titled, Love's True Second Chance. In it, he shares the history of his relationship with Debbie, his high school sweetheart, and the love they shared until shortly after he relocated in hopes of achieving a post-secondary education. Jeff Dawson shares the journey his life had taken when Debbie wasn't part of it - how a marriage ended in divorce, though he continued to love the children he had sired during his marriage. However, the greatest part of the story is when Jeff and Debbie finally decided to meet after nearly three decades had passed. It was a wonderful journey which I enjoyed. Watching Jeff interact with Debbie as their love was rekindled (to a greater degree than the love they shared in high school) was a gift I was privileged to witness, even if it was a few years after the fact. Seeing Jeff set boundaries with Debbie's daughters, Jessica and Amanda, was intriguing and demonstrated a level of tough (though non-abusive) love. Indeed, Jeff gave me some tips to try (as a parent) in terms of getting my children to listen more effectively. I knew the fairy tale existence wouldn't continue - since I knew the outcome of the book going in. Debbie's body was becoming more tired and pain had settled into her back, making it difficult for her to stand. I sensed that Cancer had returned but the love she felt toward Jeff and her daughters - the selfless sacrifices she made to enjoy spending quality time with them while she could - will forever stand out in my mind. Cancer did return with a vengeance and Debbie wasn't granted much time with her family after the latest diagnosis. However, she was surrounded by love - even to the end - which is an amazing testament to the unbreakable bonds of love. That a man could look on - with his heart breaking into a million pieces - as the love of his life passes from one life to another; that a daughter could have the courage to ask if her mom remembers her, taking the risk that the answer could break her heart and devastate her soul are just two of the courageous actions I witnessed while reading Love's True Second Chance. This story wasn't written to garner awards and accolades from various literary societies. It wasn't written and re-written to make sure every comma was in place. It was written by a man about one of the most painful periods of his life, as a means of finding healing - finding a way to cope with saying good-bye to the woman he loved with all his heart and soul. To anyone who has loved and lost, or is in the process of losing a loved one to Cancer or some other terminal disease, I would highly recommend you read this book and witness Jeff's and Debbie's journey for yourself. It really does prove that, in matters of the heart, every moment counts; we want every moment we can get with those we love, even if it means watching them draw their last breath. If you would like to learn more about Jeff and Debbie's story, just click the book cover. It will take you to the book's page on Amazon. Many thanks for the kind words Norma. I'm so glad the story touched you in many ways. It was tough having to say goodbye to Debbie, but I know this much, I go through again if given the chance. Love was worth a second chance.